Professor, Athens University of Economics and Business, Greece. His research focuses on questions of inequality, poverty, social exclusion, returns to education and social policy (especially, the redistributive role of the state). 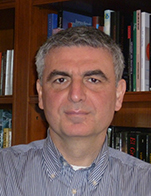 He is Research Fellow of the Institute for the Study of Labor (IZA, Bonn) and Senior Research Fellow of the Hellenic Observatory (LSE, London). During the period 2012-2014 he was Chairman of the Greek Government's Council of Economic Advisers and member of the EU Economic and Financial Committee (EFC) and Eurogroup Working Group (EWG) as well as alternate member of Ecofin and Eurogroup. He has also been Social Policy advisor to Prime Ministers G. Papandreou (2010-2011) and L. Papademos (2011-2012) and a member of the EU Economic Policy Committee (EPC, 2010-2011).